Microsoft’s Wireless Mobile Mouse 3500 is a stylish mouse that is a comfortable fit for most hands and perfect for the mobile user. The mouse features Microsoft’s BlueTrack technology and USB transceiver for wireless connectivity. The mouse has a transceiver that can remain plugged into the USB port of the computer or stored within a slot in the bottom of the mouse when you’re on the go. This Plug-And-Go feature is a great convenience for the mobile user. Connectivity to the transceiver had little delay, unlike Bluetooth mouse. The 2.4 gHz wireless range is up to 15 feet. Microsoft has marketed this as the 4-wheel drive of mice due to the BlueTrack technology. BlueTrack enables tracking on virtually any surface utilizing a large beam that allows accurate navigation on most surfaces and no trapping of the signal to the sensor. This is a big advantage over optical mice that do not work on multiple surfaces. The mouse continues functioning even in presence of dust which is a feature lacking in laser mice. My attempts to use the mouse on carpet and reflective surfaces were successful. The mouse takes a single AA battery and has a 8-month battery life. Battery status indicator provides battery power level. Unfortunately, you have to manually turn the mouse off after use or the battery can drain overnight. Auto-shutoff would have been a really big plus. 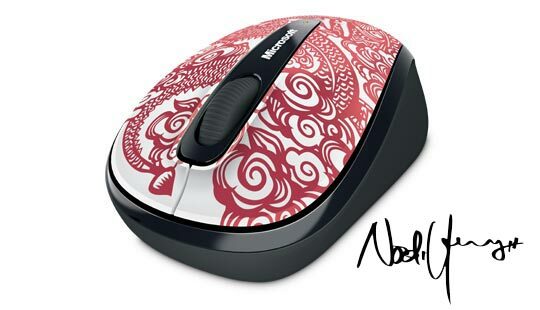 The Artist Edition of the Microsoft Wireless Mouse 3500 allows you to choose from six unique mice designed by five different artists. This feature allows you choose a mouse that reflects your personal style. I had no issues setting up or using this mouse. Since my hands are relatively small it fit comfortably in my palm. The small size of the mouse (2.25″/57.1mm x 3.75″/95.4mm) may be an issue for users with larger hands which will be the case with most mobile mice since compact size is essential to mobility. Setup on both the PC and Mac required three steps: insert AA battery, insert the transceiver into the USB port of the computer, and download and install the IntelliPoint software which is required for the magnifier button. The Microsoft Wireless Mobile Mouse 3500 Studio Series – Artist Edition is a nice mouse for the price. This is now the mouse I use for both my work and home PC. Due to my workflow on the Mac, the trackpad is more convenient. If style, comfort, and ease of use are on your list of must-haves for a wireless mouse then this is the one for you.